This post is about how to take the npruntime code sample that I have blogged about and install it as a chrome extension. In this series of articles I have provided the code to build a simple NPAPI plugin. The next steps are to register the plugin with Firefox and Google chrome so we can test the code. To install a plugin on Firefox under windows you need to use the registry. That is the most reliable method to install the plugin. The registry keys used to install the plugin are located in the HKey Local Machine (HKLM) registry hive, so administrative permissions will be required to install the plugin. Windows Registry Editor Version 5.00 ; for 32 bit installations [HKEY_LOCAL_MACHINESOFTWAREMozillaPlugins@conedogers.com/npruntime,version=1.0.0.3] "Path"="npruntime.dll" "ProductName"="npruntime" "Vendor"="conedogers.com" "Version"="1.0.0.3" ; for 64 bit OS installation [HKEY_LOCAL_MACHINESOFTWAREWow6432NodeMozillaPlugins@conedogers.com/npruntime,version=1.0.0.3] "Path"="npruntime.dll" "ProductName"="npruntime" "Vendor"="conedogers.com" "Version"="1.0.0.3"
The path should be the absolute path to the npruntime dll. 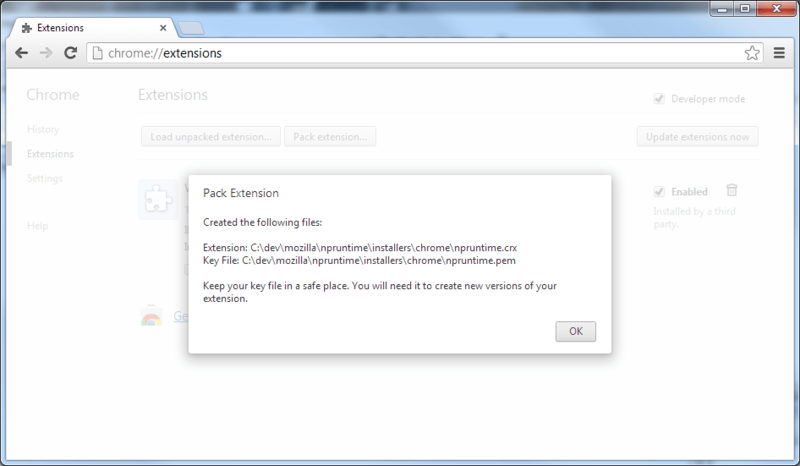 Installation on chrome is almost as easy. 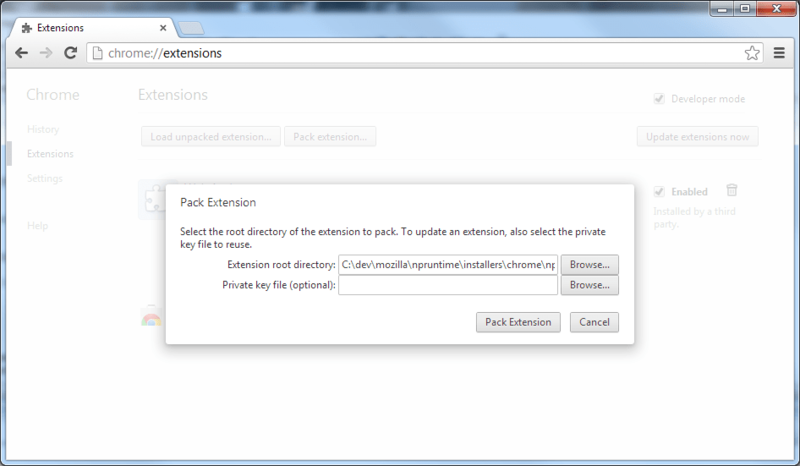 Google has added a few steps to package the NPAPI control as an extension. This extension can either display the plugin publicly, which could expose the client browser to security threats, or you can make the plugin private which only allows your script to access the plugin. To begin, we need to create a manifest file manifest.json in a sub-folder that is named for the extension. For this sample, there is a sub-folder installersChrome. Inside this sub-folder we have a folder named npruntime. Inside this folder we place all the files needed for the chrome extension. The first step of installing the chrome extension is to create the CRX package. To do this you need to navigate to the Chrome://extensions page and select the developer mode by selecting the checkbox in the upper right hand corner. Once you have enabled developer mode, select the pack extension button. Select the folder where the we have the nanifest.json file. 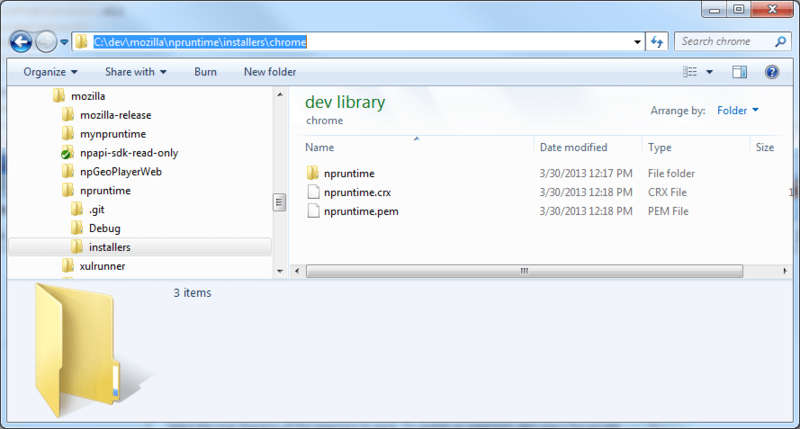 For this sample, navigate to the sub-folder npruntime inside installerschrome. When we succeed with the packaging, we will have the npruntime.crx and npruntime.pem file. DO NOT lose the pem file! this is a key assigned by chrome that is a key assigned to the control. Now that you have the packaged extension you need to retrieve the extension ID. To do this, you open the Chrome://extensions page and in the developer section select the “Load unpacked extension…” button. 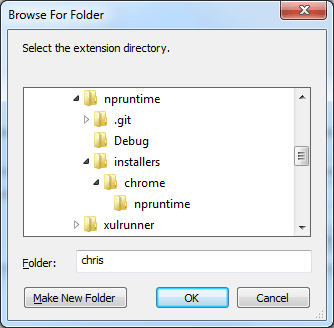 You will be prompted to select the control to load, so navigate to the installerschrome folder and select the npruntime folder to load it into chrome. After you load the unpacked extension, you will see a screen similar to this. Highlighted is the extension ID assigned to this control. Now that you have the extension ID, you can complete the registration of the packaged NPAPI control by adding a pair of registry keys to the windows registry. Windows Registry Editor Version 5.00 ; 32 bit operating systems. [HKEY_LOCAL_MACHINESOFTWAREGoogleChromeExtensionsooaihagiflmbfpeiggpknanhplcngmld] "Path"="C:\dev\mozilla\npruntime\installers\chrome\npruntime\npruntime.dll" "Version"="1.0.0.3" ; 64 bit operating systems [HKEY_LOCAL_MACHINESOFTWAREWow6432NodeGoogleChromeExtensionsooaihagiflmbfpeiggpknanhplcngmld] "Path"="C:\dev\mozilla\npruntime\installers\chrome\npruntime\npruntime.dll" "Version"="1.0.0.3"
; 32 bit operating systems. And that should do it. You should be able to view the chrome NPAPI extension in the test.html file provided with the sample. Hey! thanks for the nice article. i have installed NPAPI plugin using this extension. is there a way to install plugin in chrome without using extension. i am interested in getting the DOM details using my NPAPI plugin in chrome browser could you please guide me on that.. Currently you need to have the Chrome extension to install a NPAPI plugin as far as I am aware of. I am sure you have read this link , since you have already installed the plugin. To get access to the DOM requires a bit a knowledge of how NPAPI works. With the NPAPI plugin you have complete access to the page that contains the loaded plugin. .
Feel free to ask if you have more questions. // The message we want to send. // Get the debug object. // Invoke the call with the message! // memory leaks will happen. i am have written this code inside “ScriptablePluginObject::Invoke” function but when i trying to call test.html is is getting crashed. please let me know “am i calling this code at right place” and “how can i test this code”. Without looking at test.html, it’s hard to say what is going on. Verify that the web page is loading the plug in properly. This could be a cause of the crash. Also, when are you invoking the call from the plugin? The page should be fully loaded. If you try to invoke the plugin before the page is loaded, I would expect it to crash. i have verified that the page is loading successfully. The Firefox install instructions were really helpful. Thanks a bunch! I followed almost exactly what you described but I couldn’t load it. b)	Launched Chrome, changed the URL to “chrome://extensions”, clicked “Pack extension….” Button, packaged the plugin (which generated CRX and PEM files) and retrieved the ID (I got “lkdiknnjbpofajkcihlajefcmdojphem” ID) by clicking “Load unpacked extension” button. c)	Since the step in (b) already loaded the npruntime plugin and I wanted to test if Chrome would load the plugin, I removed “npruntime” from “chrome://extensions” page by clicking the trash icon, and closed Chrome. f)	Launched Chrome again, but Chrome didn’t load it. As a result, when I opened test.html from Chrome, it complaint “No plug-in available to display this content”. So I wonder if there is any step I did wrong, or I misunderstood. It appears you did everything right. It might be chrome. Google along with Firefox are slowly deprecating NPAPI support from the browsers. I was working with a company in late 2013 and we could not get our NPAPI controls to load either. I suspect that Google has either accelerated their shutdown of NPAPI, or because this sample code is unsigned, chrome is not loading the unsigned control. Either way, NPAPI’s days are numbered. Thank you for any other excellent article. The place else could anyone get that type off information in such a perfect manner of writing? Other information on NPAPI was taken from various searches off the internet. Feel free to use my blog articles in your presentation, but please properly list my blog as a reference for your work. You should place the plugin into a folder where you want to install it. At this point you would follow the normal procedures for installing a windows app or plugin. So if you want to grant access for all users, you would install the plugin into a folder in the “Program files (x86)” folder, or if you want only the current user to have access, install the plugin to their AppDataLocalLow or AppDataRoaming folder and then use the absolute path to the plugin location in the registry key MozillaPlugins.